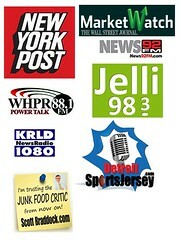 If you read JFC on any regular basis, and why wouldn’t you?…. you know we love THE SEV. So hearing that they were coming out with their own line of “grab-n-go” locally prepared meals…we gots excited y’all! And nervous….I mean let’s get real…this could go either way. 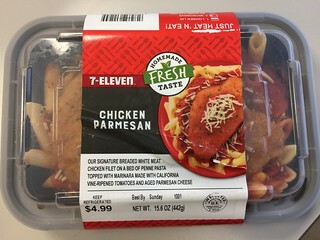 Once I heard that Chicken Parm was one of the choices, then I was super-curious…was it possible to make a heat-n-eat Chicken Parm that I could eat sitting on the curb at the Sev…and be happy with it? I wasn’t totally shocked but I was pleasantly surprised how GOOD it was. I mean you have to keep in mind…you are getting this from a convenience store at any given moment. I have certainly had worse frozen dinners…and I can think of a couple of Italian restaurants that wishes their chicken parm was this good. For Five Bucks??? nice. I got to give it to The Sev for stepping up their game on something like this. There are FOURTEEN different dishes available at any one time. The ONLY problem I see with this is marketing. The Sev, for whatever reason, has chosen to use one of the Dallas Cowboys as their spokesperson for this here locally. No football player is going to appeal to my sense of convenience or give something like “grab-n-go” food a chance. EVER. I would hate to see such a great idea fall to the wayside due to the fact that NOBODY has heard that it’s available or they stumbled with the ad campaign. The chicken parm…at least…is worth a try. The Two for $25 Special is back at Spaghetti Warehouse and be warned – you will not leave that place hungry. 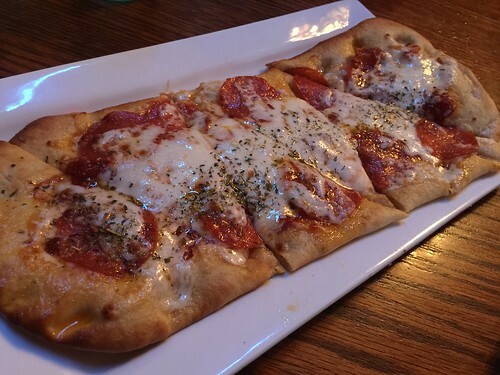 1 appetizer to share – we got the pepperoni flatbread and it was very-very good. I have been to other restaurants that have these type of “package” deals and there always seems to be a very clear weak link in their offer. But looking at all the menu options here though, you will notice they are offering you their best items for each course. No short cuts or “mini” versions to pad the offer. They are all solid choices. As I stated before, both of us were pretty surprised at just how much we liked the little flatbread appetizer. Great crust and plenty of sauce,cheese, and pepperoni to satisfy. To be honest after this and the salad we were both pretty much full but then the lasagna and chicken parm arrive. They were both just as great as always…they might be a tad smaller than a full portion if you ordered it alone but it was more than enough food to go around. Totally worth the price. In fact it felt like I had gotten away with something. All this for two people for twenty-five bucks? Hell of a deal!